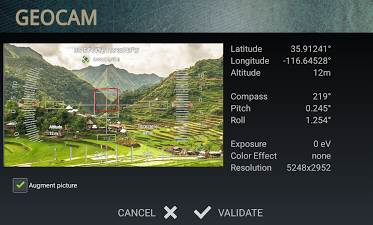 These are essentially photos that have an extra layer of geographical data such as GPS position, compass orientation, pitch, roll, altitude, etc. This data is added into the EXIF metadata and can selectively be drawn on images as an overlay. Geo Pictures can be seen and shared from your phone, or exported to Google Maps or to Google Earth on your personal computer with the export feature. You can share those albums with anyone who can run Google Earth. These two serve different purposes. You can choose to add overlay data or not, but geocam will always add metadata to a picture if it is available (GPS fix available). The autofocus will be triggered, then a picture will be taken. You are then brought to the review screen, which shows you the picture, and what metadata is available. Note that if you do not have an accurate GPS position, the GPS info might not be saved into the picture to avoid having incorrect data. Augment picture to choose whether you want the overlay information to be writte on top of the image. Change this value and you will see the picture as it will be saved on the preview window, with or without this extra data. Save file to decide if you want the picture saved in your phone's memory or discard it after this screen. To open the Gallery, touch the icon at the bottom left of the screen (touch the screen anywhere first to make these icons appear). It will show all your pictures taken with GeoCam and display their geo-information. It will also show any Video if you have the pro version. Click on a photo or video to display it, you can also tick items and click share/delete. Exposure compensation: use this when your camera is either underexposing or overexposing. You might not see a change directly on the preview screen, as if you use auto screen brightness your phone will compensate. Color effect. You can use all color effects supported by your camera menufacturer, such as Monochrome, Sepia, Aqua, etc. Be creative. Picture size. Easy one. If you take large pictures, you might see a message "out of memory" when GeoCam is trying to process them. To work around this, select a smaller picture size. Zoom Ratio. Control the digital zoom of your device, if supported. Video Quality (Pro version only): resolution of video files. Watermarks (Pro version only): you can by default add your company name and/or logo to geo pictures. You can also choose to add a custom comment to each photo individually.